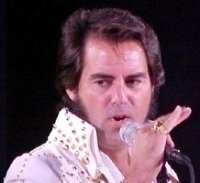 “Remembering Elvis”, a man who clearly impacted the music world is the goal of this Elvis Tribute Artist. 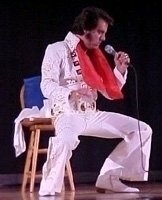 From his highly detailed costumes to even imitating impromptu’s in the Elvis performances, he works extremely hard to present the music in the way Elvis himself did. 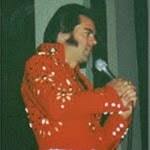 He has always been an Elvis fan, and at the age of seven, he was taken to see Elvis perform in Fayetteville, NC. He strives to bring the same energy and charisma to his show that he saw in Elvis’ unforgettable performance that night. As he assumes the persona of “Elvis” draws cheers from the crowd as he brings Elvis to life in a striking way through vocals and his visual portrayal Elvis Presley Celebrity Look Alike Impersonator Show. His repertoire includes almost everyone’s favorite, ranging from “Hound Dog” to Polk Salad Annie”, including the Gospel songs and covering all the ground in between. His visual performance is equally effective, as he provides a striking presence, with some great hip swiveling. He is blessed with his talent, as he has never had voice lessons. He says that Elvis is his voice teacher. 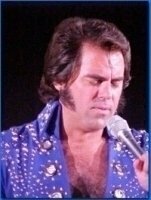 Besides his tremendous likeness to Elvis’ voice, people are also equally impressed with his humbleness and audience interaction. His great personality tops off an already classy Elvis Presley Celebrity Look Alike Impersonator Show. He performs at parties for all occasions, company events, town festivals, car shows and holiday events. Elvis Presley Celebrity Look Alike Lookalike Impersonator Tribute Artist.